With the third overall pick in the 2014 NHL Entry Draft, the Edmonton Oilers hold a key piece to their future. They will also have a few options with that pick, depending on how the first two picks fall with Florida and Buffalo ahead of the Oilers in the line to the draft podium. Edmontonoilers.com will be profiling some of the NHL’s top prospects leading up to the draft at the Wells Fargo Center in Philadelphia, Pennsylvania, June 27-28. We took a look at Sam Bennett on Tuesday and today we’ll examine another top centre prospect in Prince Albert’s Leon Draisaitl. The Cologne, Germany native finished fourth in the final NHL Central Scouting rankings. Where Bennett is a smaller centre who plays bigger, Draisaitl is physically a bigger presence in the middle. At 6’1.5’’ and close to 210 pounds, Draisaitl is an enticing option to a team, like the Oilers, that is looking to add size to their centre group. 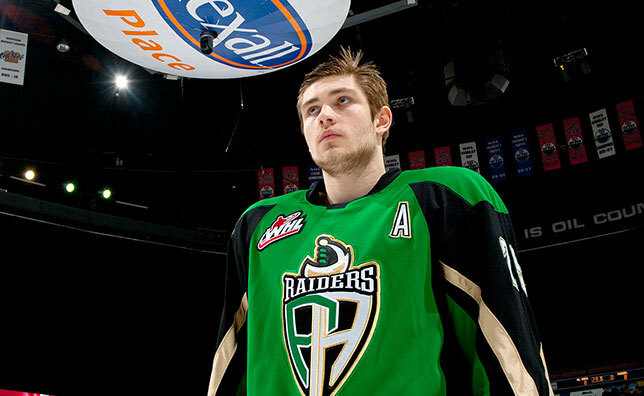 Draisaitl, 18, doesn’t only have a big frame but he can move and make plays on the ice. In 64 games in the WHL this season, Draisaitl finished with 38 goals and 67 assists for 105 points. He finished tied for fourth in the league in scoring with fellow top draft eligible centre Sam Reinhart (Kootenay). During the regular season he scored at a 1.64 point-per-game pace, this compared to Bennett’s 1.60 scoring rate. Draisaitl has said he feels he resembles San Jose’s Joe Thornton but he has also been compared to Los Angeles’ Anze Kopitar. Seeing as both of those players are key components on playoff teams and both are coming off of 70-plus point seasons, that’s not a bad thing. When we compare Bennett to Draisaitl again, the latter claims himself to be more offensive. Bennett said he focuses more on the defensive side of his game. “I think I’m more of an offensive player, skilled player, a playmaker who sees the ice very well and who is able to make good plays,” Draisaitl told NHL.com. He does bring that offensive presence. Where Draisaitl could help a team like the Oilers is on the power play. He finished the season with 12 power play goals. 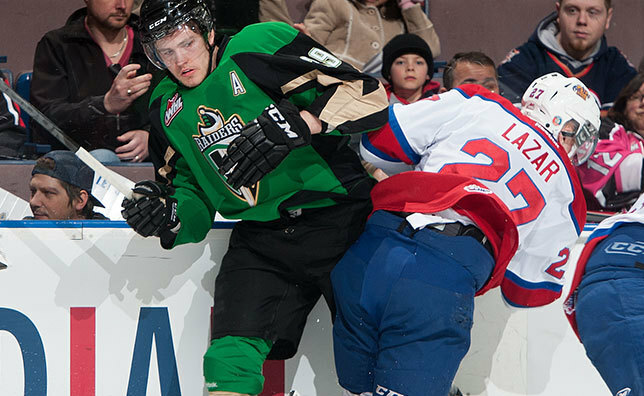 In the 2012-13 season, Prince Albert finished dead last in the WHL in power play percentage (15.4). They leapt to third in the league this season, converting at a 24.9% clip. Draisaitl’s head coach said the young forward was a big part of that improvement, driving the team forward on the man advantage. The Oilers finished the season 21st in the NHL on the power play (17%). They will most certainly be looking to provide some help in that part of the game. Clouston says Draisaitl is not a one-trick pony and helped push the team into the playoffs. As for work ethic and character, Draisaitl is backed by his head coach and TSN’s Director of Scouting Craig Button. “I don’t sugar coat things,” Clouston said. “Leon is a great kid, he’s fun to coach, he’s a guy who shows up at the rink, he’s focused, he’s like any other 18 year-old. There’s obviously areas he has to improve on but that’s kind of the fun thing about it. We saw him at the start of the year where he was, I’m not going to say he was one-dimensional but he was not as multi-dimensional as he sure ended up at the end of the season. That to me has a lot to do with his attitude. Draisaitl has been called an intelligent playmaker with good instincts and player with ‘off the charts vision’ by International Scouting Services. With good hockey intelligence, vision and reaction time, he also has the frame to shield the puck from defenders. As for whether or not he would be happy if Edmonton called his name at the draft, just see what he had to say when Prince Albert visited to face the Oil Kings in the WHL playoffs. Bennett has the attitude, drive and defensive game that the Oilers covet. Draisaitl has the size, the power play ability and the offensive skills to add to the centre position in Edmonton as well. Or are you a fan of Reinhart (who we will profile before the draft)? Or maybe you are an Aaron Ekblad fan. Any of these players could be gone by the third pick and there are still more options and a lot more research and discussion left to be done before the Oilers make their choice. Stay tuned for another prospect profile.